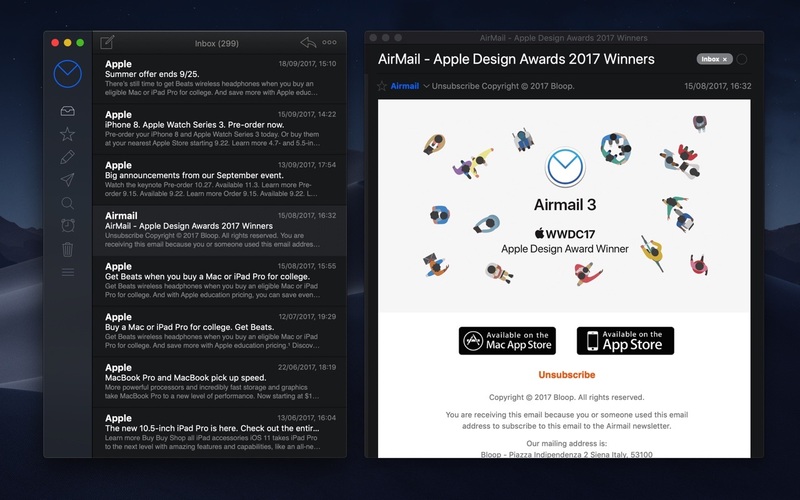 Airmail 3.6.50 – Powerful, minimal email client. Airmail was designed from the ground to retain the same experience with a single or multiple accounts and provide a quick, modern and easy-to-use user experience. Airmail is clean and allows you to get to your emails without interruption — it’s the mail client for the 21st century. We have taken usability and function to the next level with Airmail and bring a striking-design with support for all major email services. Switch between accounts like a breeze and quick reply to incoming messages within seconds — email has never been so easy and productive. Next story AirRadar 4.1.6 – Easy-to-use, personalized wireless network scanner. Previous story djay Pro 2.0.8 – Transform your Mac into a full-fledged DJ system. Transmit 5.2 – Excellent FTP/SFTP client. iA Writer 5.1.3 – Professional writing suite. MacBreakZ 5.33 – Reminds you to take periodic breaks from your projects.